BISHOP, Ga. -- A golf course can have a difficult time shaking a bad reputation. Once a customer is subjected to poor playing conditions, especially bare or fuzzy greens, or shaky service, they are often reluctant to come back. 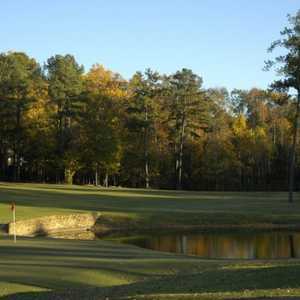 Lane Creek Golf Club: An Athens-area favorite. Originally opened in 1992, Lane Creek Golf Club changed ownership in 2006 when it also underwent a major renovation that included redesigning all of the greens and bunkers. The drainage and irrigation systems were improved as well. The lightning fast greens will test even the best golfers and they are always excellently maintained, as are the immaculately manicured fairways. Lane Creek Golf Club is the exception to the rule. Lane Creek has benefited from a change in ownership that reversed its fortunes. Now the club, located minutes from Athens, is one of the favorites in the area. The public facility is again on track to play 38,000 rounds in 2013. It's now hard to believe that this place ever had a bad image. The change of attitude began in May 2006 when Butch Foust and partners bought the under-funded club (which opened in 1992) with the intent of turning things around. Foust came from a golf family and earned an agronomy degree at Penn State. He spent time at Augusta National (where he met and was mentored by Billy Fuller) before he became director of agronomy over the six courses at Reynolds Plantation. Foust has helped drive the change in attitude at Lane Creek with his outgoing personality. The Mike Young-designed course was closed in the summer of 2006 while Foust and his partners at Medalist Golf (Wayne Massey and Mike O'Shea) changed all the greens to Champions Bermuda. They reworked all the bunkers, solved some irrigation issues, remodeled a hazard, completed a few additional tweaks and basically cleaned the place up. It opened to rave reviews on Labor Day 2006 and has been going strong since. "We have eliminated the stigma of being a golf course in bad shape," PGA Professional Chan Freeman said. "We spend a lot of our budget each year on course maintenance, and it shows." Lane Creek isn't a long golf course; it plays 6,678 to par 71 from the back tees, 6,177 from the blue tees, 5,526 from the white tees and 4,792 from the red tees. It plays over rolling hills with trees dotting most of the fairways. The greens are among the best in the area; they usually roll around 10 on the Stimpmeter but can be groomed to roll around 12 for some of the big events hosted by the facility. "The greens can be the biggest challenge. Some of them have severe undulations, and we've got a good variety of hole locations," Freeman said. The toughest hole on the course may be the seventh, a par 4 that plays 449 from the back tees. The biggest challenge lies with the elevation change over the last 60 yards to the green. The fairway climbs to meet the green, which offers some fun undulations. One of the most popular holes is the 13th, a par 4 that plays 445 from the back but a far more forgiving 384 from the white tees. Drivers must find their way in a narrow landing area. Freeman said the hole looks like something famed architect Donald Ross might have drawn. The 18th hole is a 393-yard, uphill par 4 that has fairway bunkers on the right. The trickiest part of the hole is the green, which has a false front. A hole location in the front is scary, as any short shot is going to retreat downhill. But the back locations aren't easy, either, as those can be difficult to reach. In May 2013, Lane Creek opened its Blake Adams Golf Academy. The facility has an indoor hitting bay and evaluation area and is operated by PGA instructor John Tillery, who teaches Adams and Scott Brown, who won his first PGA Tour event in 2013. 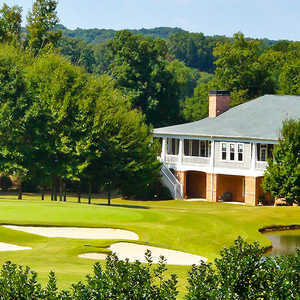 Adams, who is currently recovering from hip surgery, was on hand when the center was opened the week the Buy.com Tour paid its annual visit to the University of Georgia Golf Course. Adams brought buddies such as Will MacKenzie, Kevin Kisner, Michael Sim and Josh Broadaway with him for the festivities. 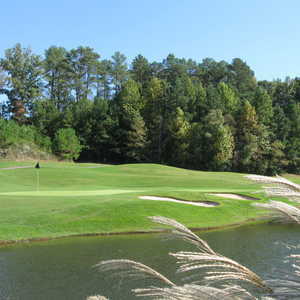 In 2012, Lane Creek Golf Club shortened the fifth hole and used the land to build a six-hole short course. The length of the holes range from 35 to 65 yards. The short course is a great option for parents to introduce the game to their children. It can also be a productive location for players to work on their short game. That enhances the already-established practice facilities. There are 12,000 square feet of grass hitting areas on the practice tee, as well as a 7,000-square-foot practice green. Stan Awtrey spent 25 years as a sports writer with the Atlanta Journal-Constitution. He is editor of Golf Georgia, the official magazine of the Georgia State Golf Association, and writes a weekly column for PGATOUR.com. His work has appeared in dozens of newspapers, magazines and Web sites.